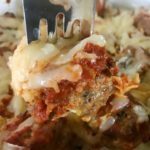 Keto Beef Zucchini Lasagna: A Family Favourite! 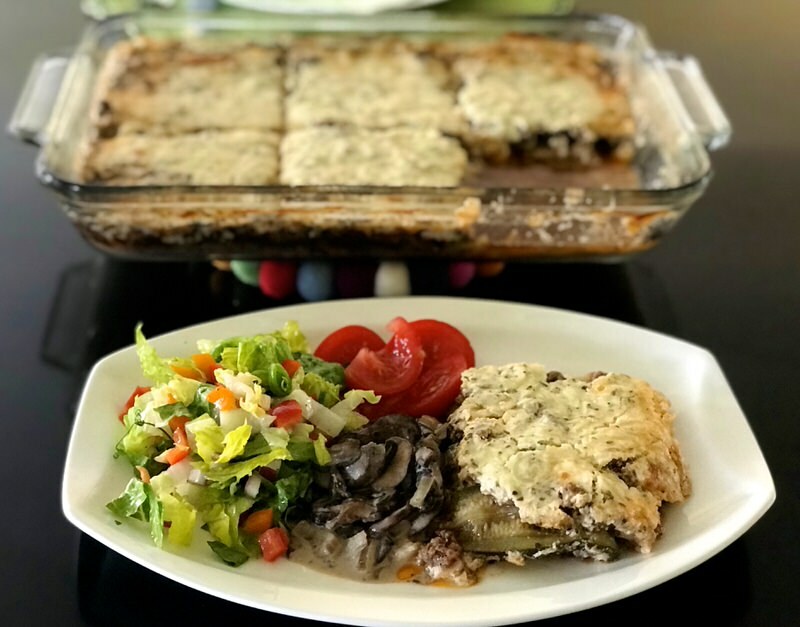 Keto Beef Zucchini Lasagna? Who knew? 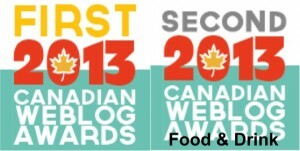 Who would ever want to mess with a traditional delicious Canadian Lasagna? Well, there comes a time in one’s life when the most bizarre possibilities are considered when one’s health is at stake. And my health? Oh, my goodness. I was in such a personal crisis and felt completely helpless as I believed I had tried everything possible to rescue myself from the deep dark unfathomable abyss I was living in daily because I had tried all I knew. However, I just didn’t know about this. 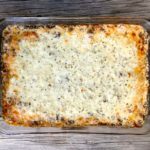 Is this Keto Beef Zucchini Lasagna delicious? Oh, my. It is surprisingly scrumptious. Vanja loves it. Ragan loves it. Mom loves it. 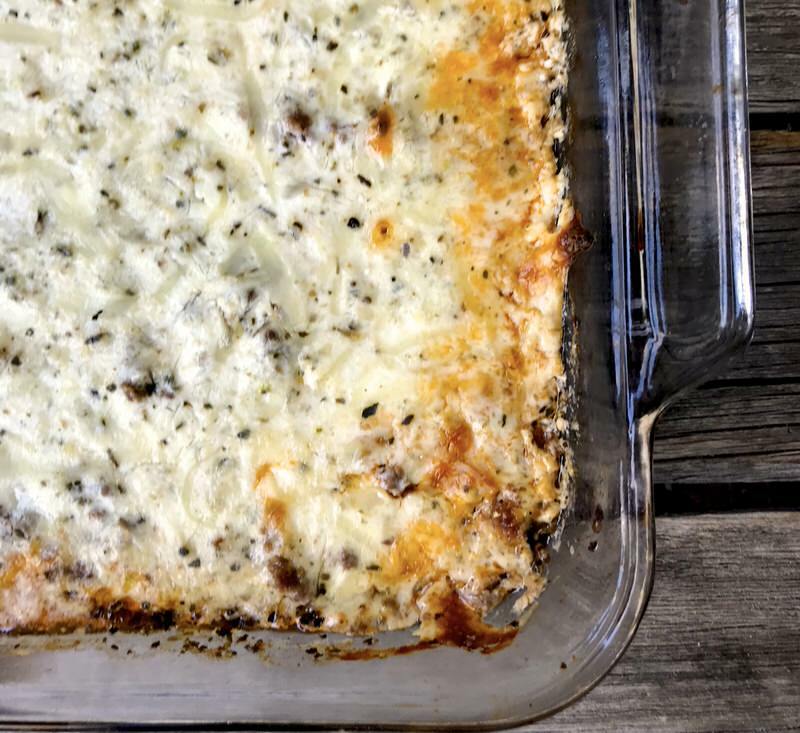 It will absolutely satisfy your craving for that cheesy, unctuous homey traditional lasagna. I was so surprised! 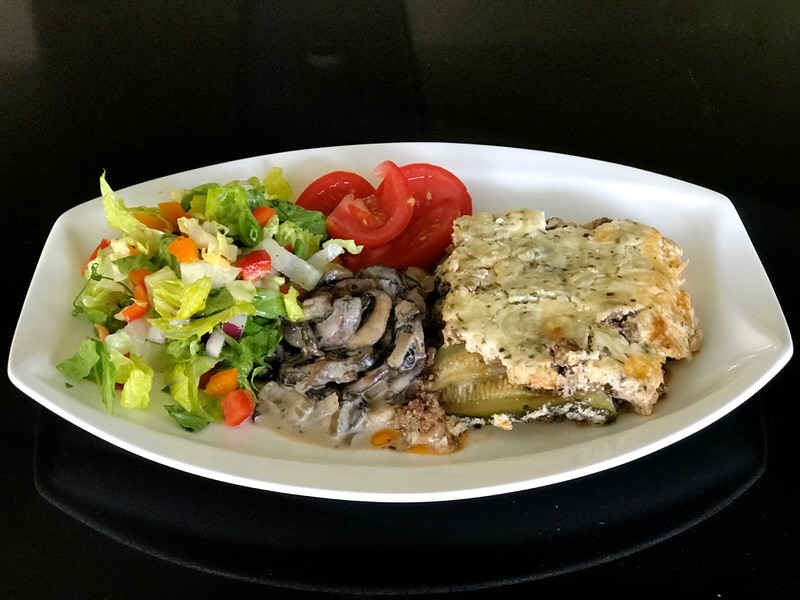 Why this Keto Beef Zucchini Lasagna instead of the Traditional Canadian version? My way of eating has changed drastically since June 2018. I haven’t eaten sugar, grains, alcohol, or root vegetables since. Why? 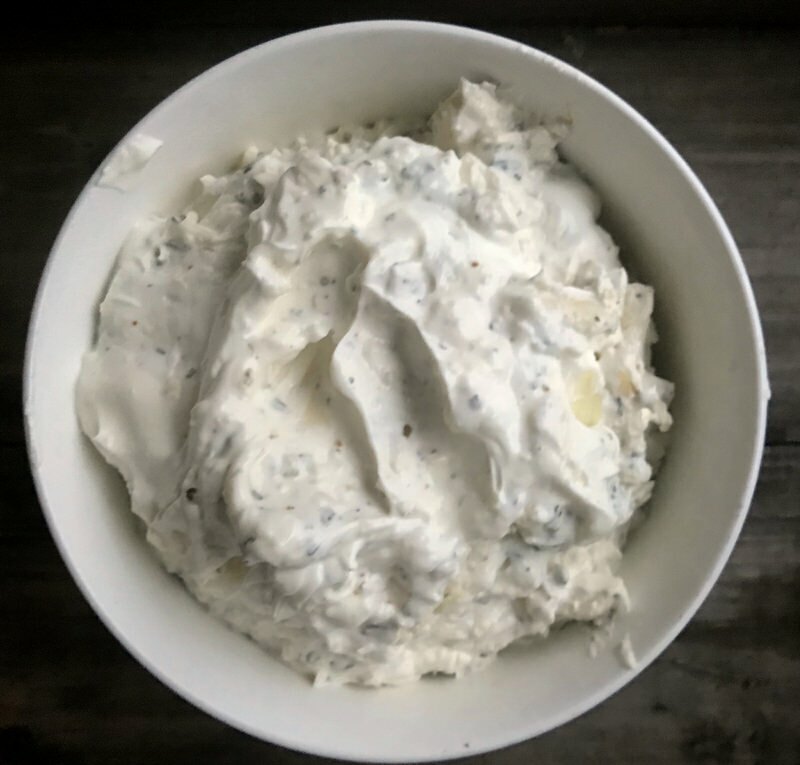 I needed desperately to reboot my gut health and had learned about the possibility of regaining my health through a new way of eating with real food supplements I had tried all I knew, yet this was one way I was not aware of. 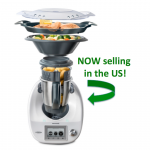 One way that I had no idea would work but was desperate enough to try… and guess what? I am revitalized, alive, have regained hope for my future, climbed out of that seemingly impossible abyss and feel I’ve discovered something miraculous. Change I never thought possible has found me to be a little of an evangelist. Forgive me. 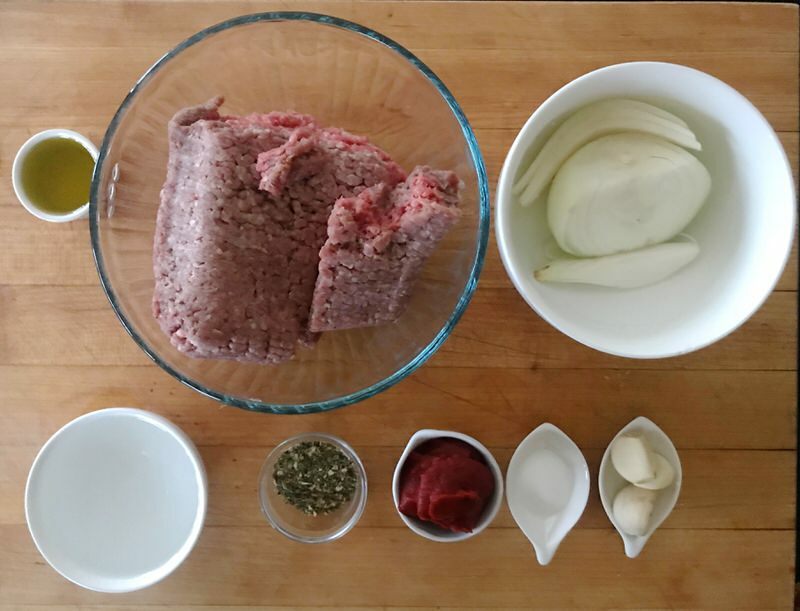 Simple ingredients: grass-fed know-your-farmer beef, onion, garlic, oil, water, tomato paste, herbs and salt. Delicious on its own! 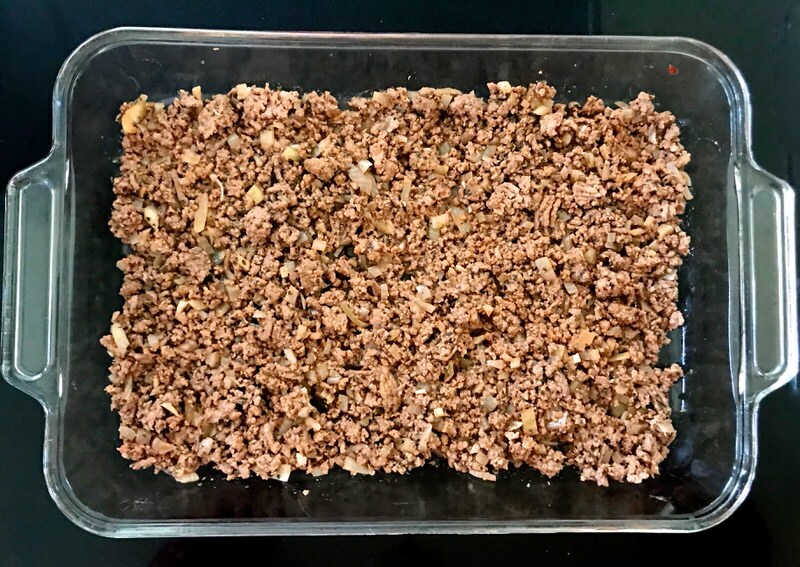 This is the healthy and flavourful protein part of the recipe but also some significant fats, too. 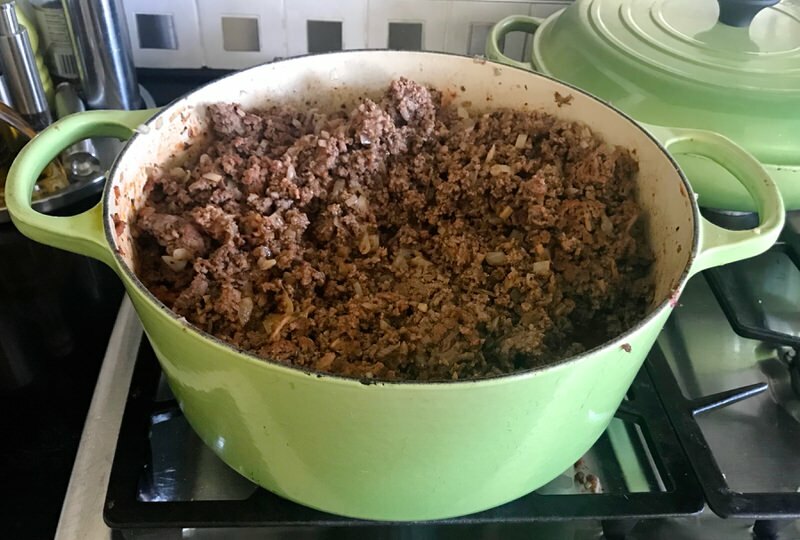 This is important, as I have found that a “soft keto” fat burning program consisting of 50% healthy fats, 25% carbs and 25% protein has fed my soul, my mind, body and spirit with health and hope. 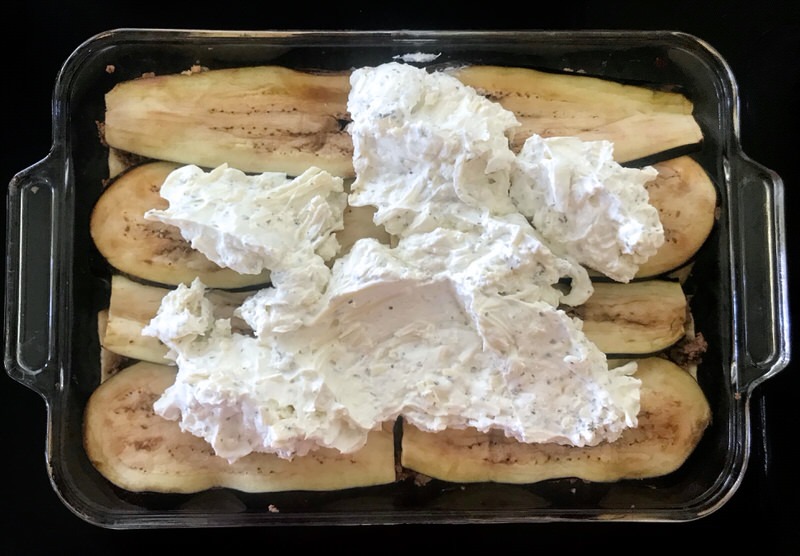 This recipe, as most keto recipes, fits 48 grams fat, 43 grams protein and 11 grams carbohydrates this fits my 50% fat, 25% protein and 25% carbohydrates. 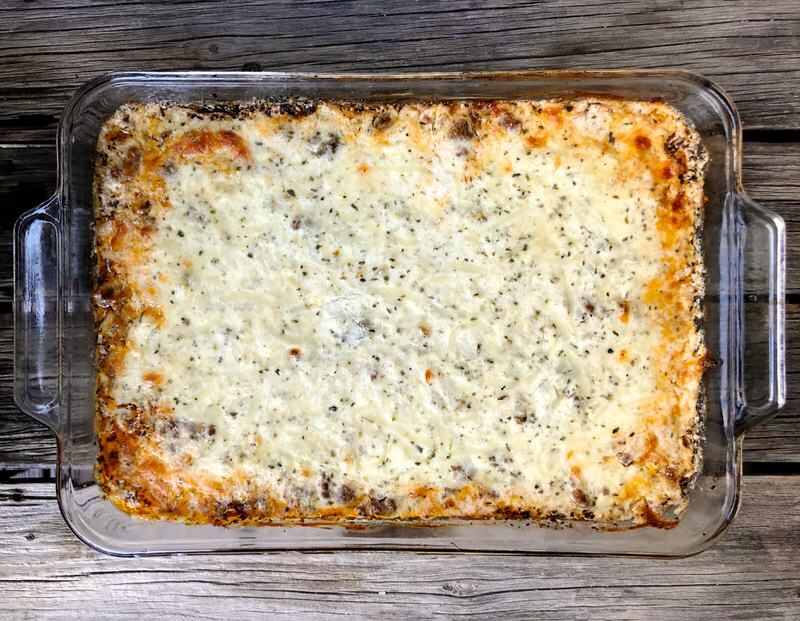 A whopping 627 calories per serving (or 314 per half serving) is likely less than a serving of the Traditional Lasagna calorie-wise! 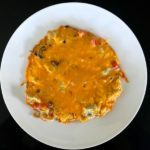 You can see the rest of my eating day accommodates for more balance than a keto program which is often 80% protein, or more, as well as plant-based nutritional supplements that make all the difference. 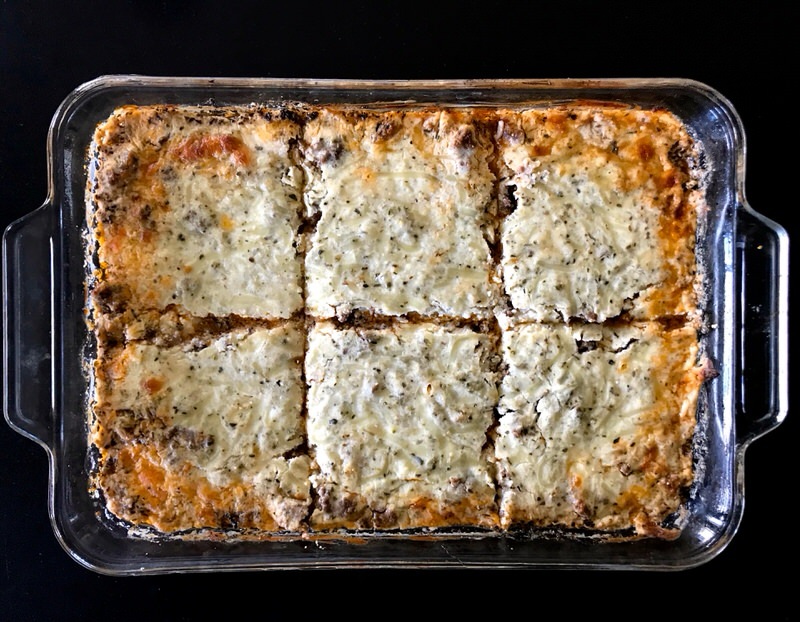 Here is that fatty, unctuous lasagna goodness. 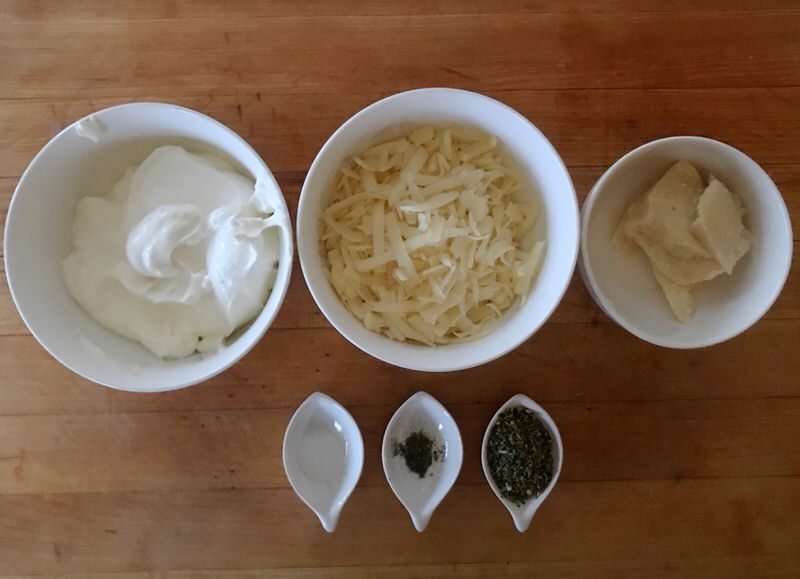 Sour cream, mozzarella, Parmesan, salt, pepper and herbs. 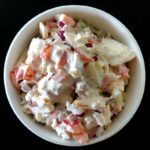 These ingredients add to the protein part of the recipe, but primarily contribute fat to the whole meal deal. Healthy fats are always best, others in moderation. 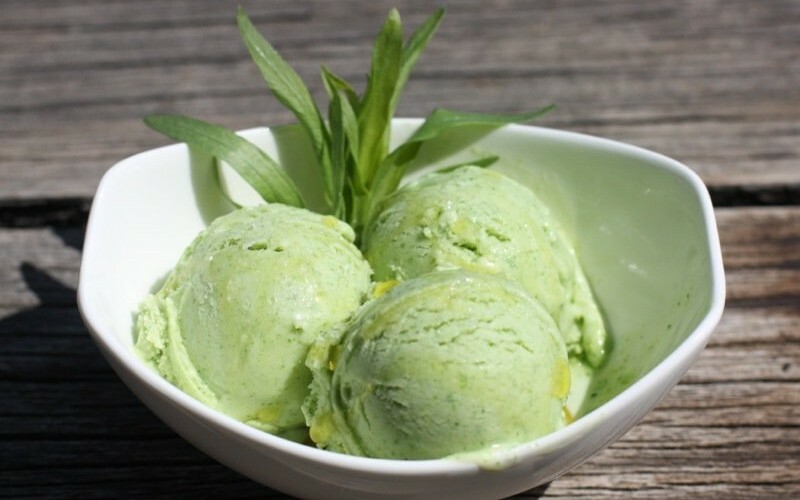 What are healthy fats? That’s another whole conversation! No grain eating means no pasta. 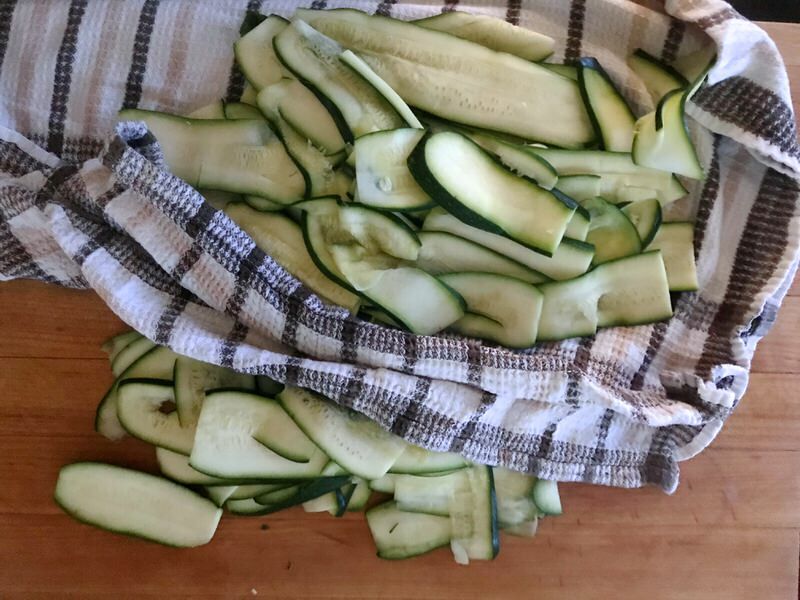 How can zucchini possibly replace pasta? Well, it doesn’t – yet, it does! 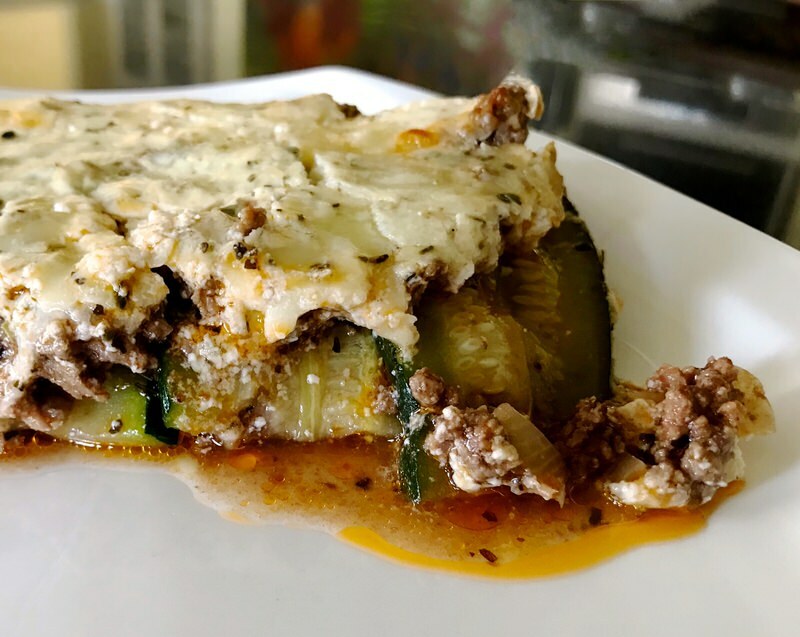 Albeit, the taste, texture and appearance are completely different, yet a thin layer of properly prepared zucchini separates the layers and communicates lasagna to the brain. 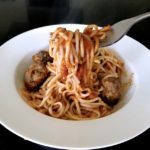 Though the taste experience is completely different pasta-wise, the eating experience is surprisingly similar. 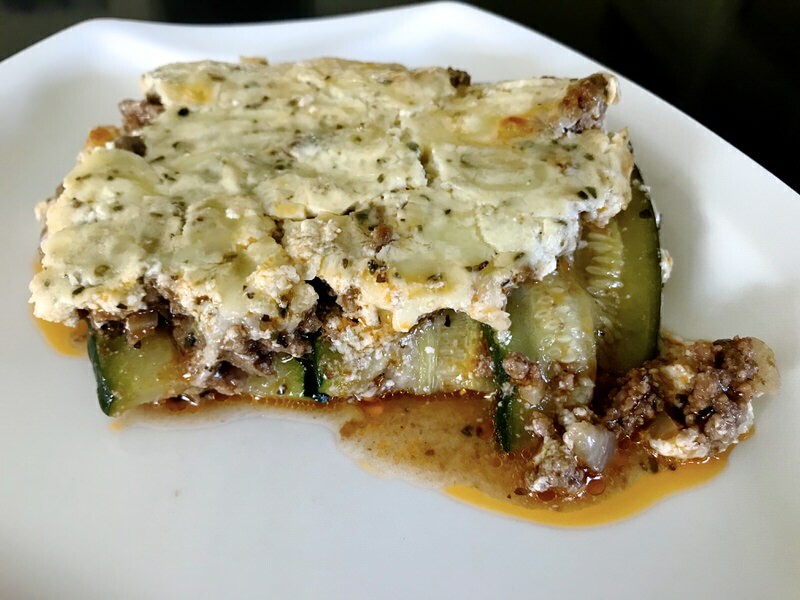 The bite looks similar to lasagna, smells just like lasagna and with the velvety cheese topping coupled with the flavourful meat sauce, the zucchini somehow finds its way to compliment the dish in a very similar way to pasta. It is a win-win! The preparation is timely. 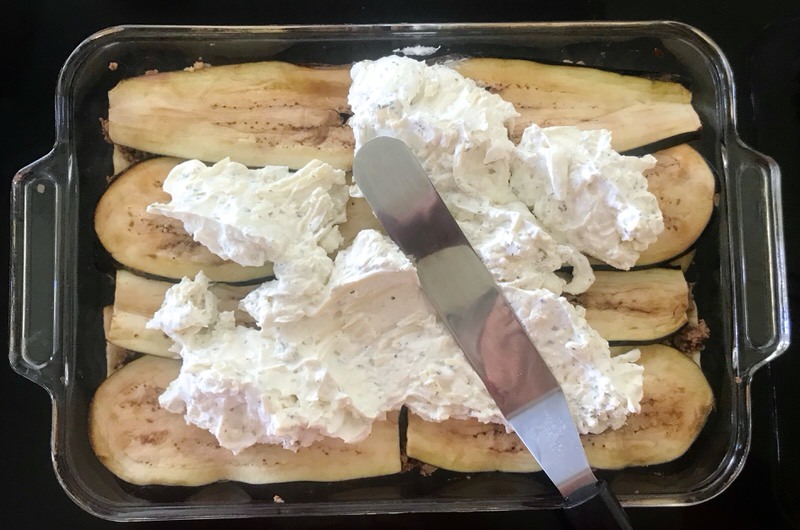 We’ve made this several times now, and I find preparing the zucchini the day prior is necessary to the enjoyment factor. Why? 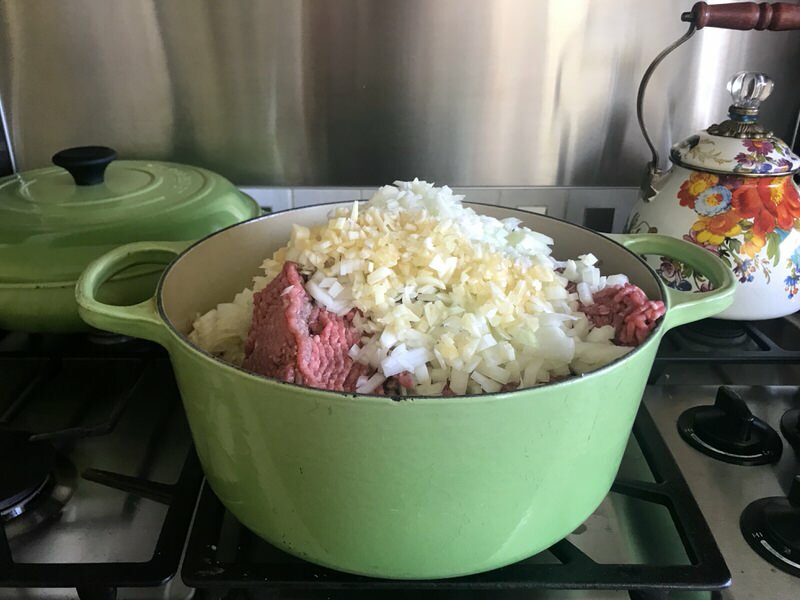 I make casserole dishes in big batches, always. One for today. One for the freezer. One (or two) for Ragan. 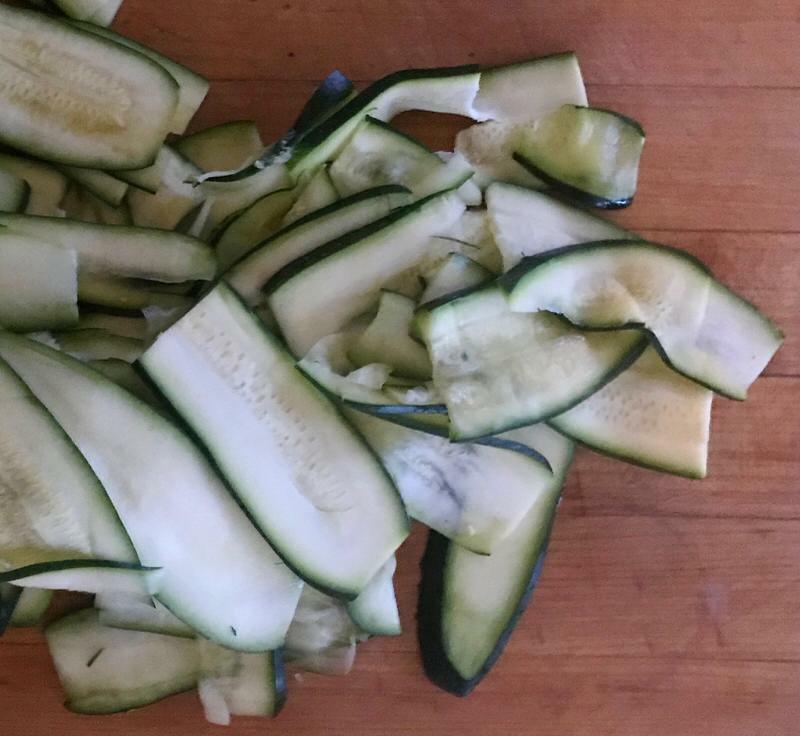 So, that’s 4 -5 medium zucchini to slice thinly with a mandoline (or a sharp knife). Then it must be salted, sit for 2-4 hours, drained and patted dry. 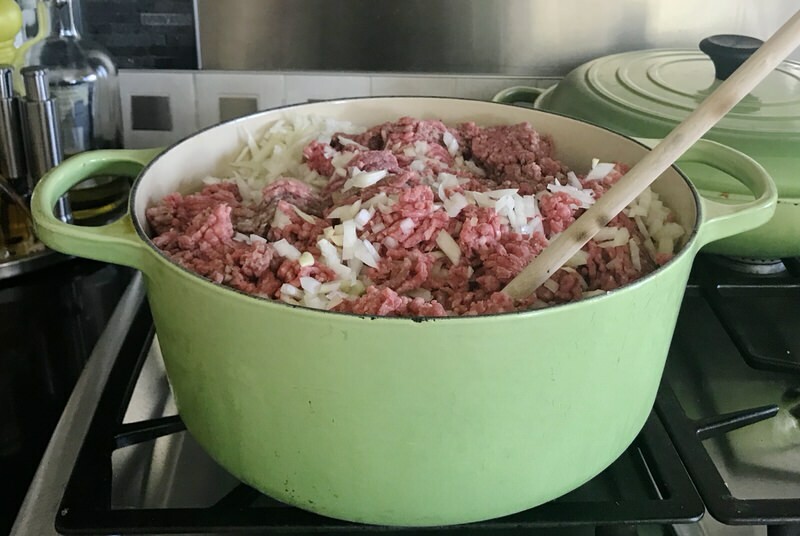 Four times the meat sauce recipe is in the pot, above. It’s just as easy to make for as one, for me. 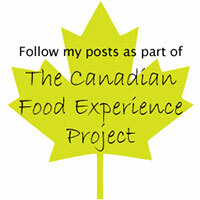 I always take a moment to celebrate the quality of ingredients I am blessed to have access to in Alberta. 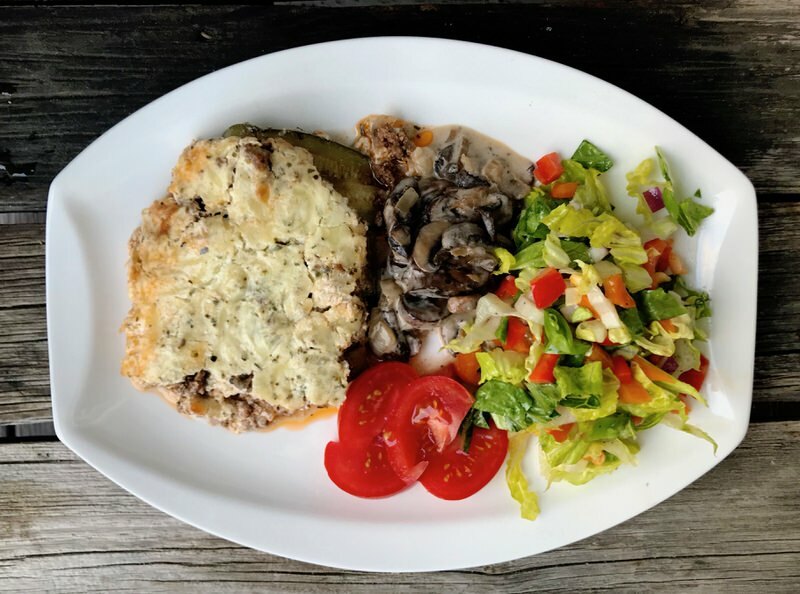 Beautiful Nature’s Green Acres Grassfed Nuveau beef and lovely vegetables from local farms. 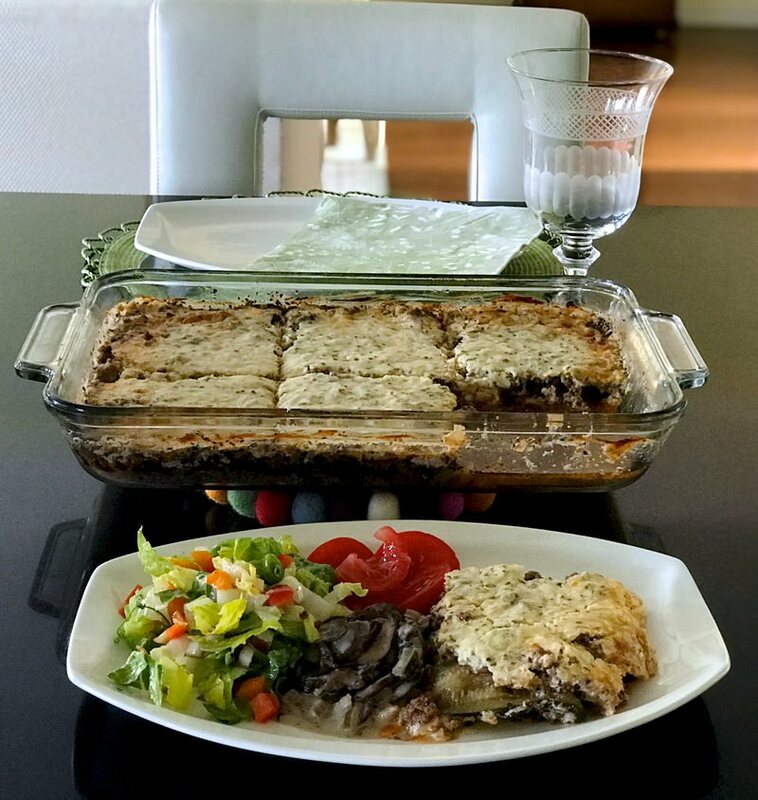 Long before my change of eating in June 2018, back to August 2007, I have been sure to purchase the most healthy produce and products for our family meals, including GMO-free and organic at all times, or almost all. 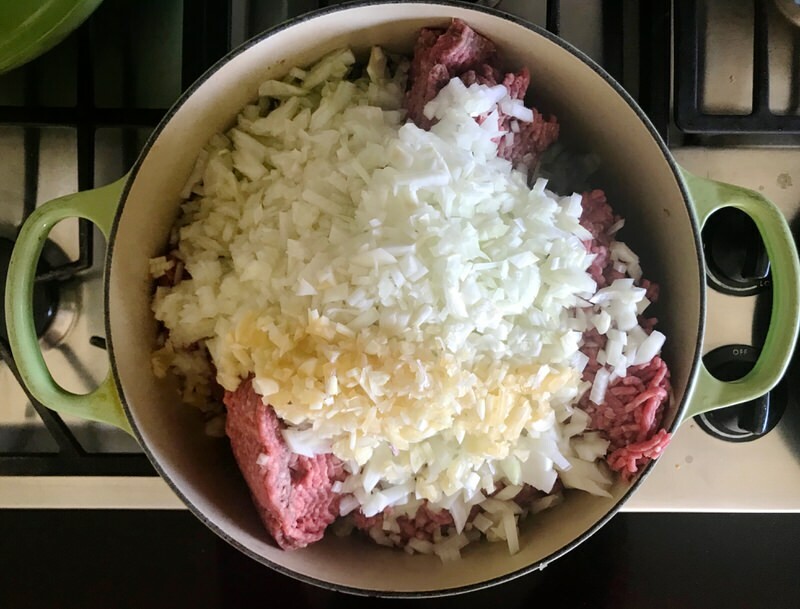 Meat, onions and garlic almost browned when spices and tomato paste is added in. 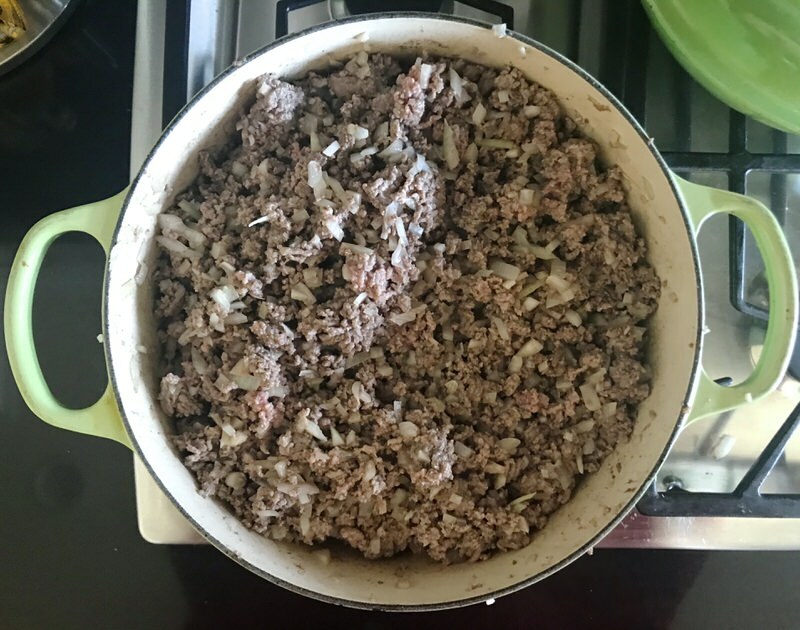 Combined well together to finish the cooking process, the meat sauce is ready. Easy? You bet. And the topping? 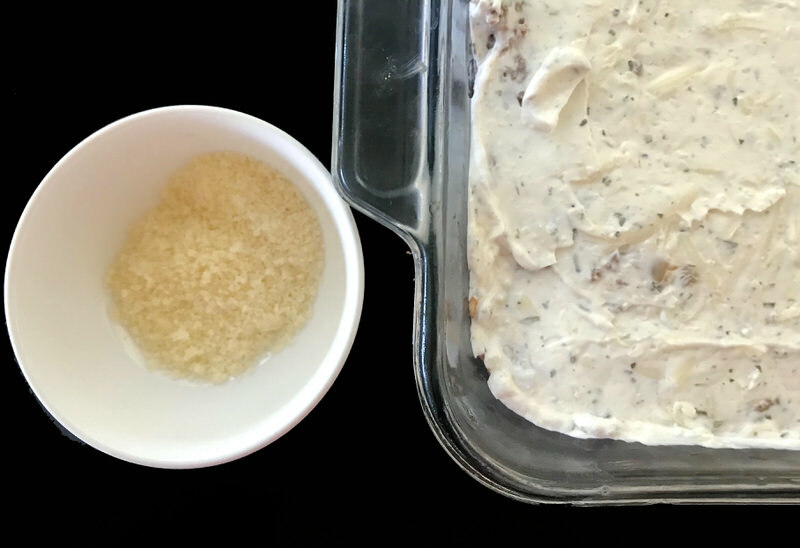 Mix it all together, reserving only 2 tablespoons of the Parmesan cheese to top the casserole. Again, easy. 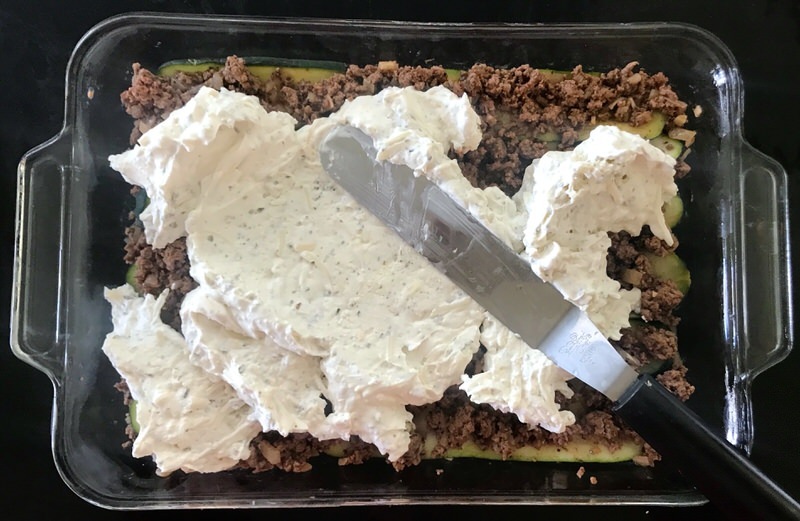 So, we have the zucchini prepared the day prior, the meat sauce ready and cooling, and the topping mixed together ready to go. 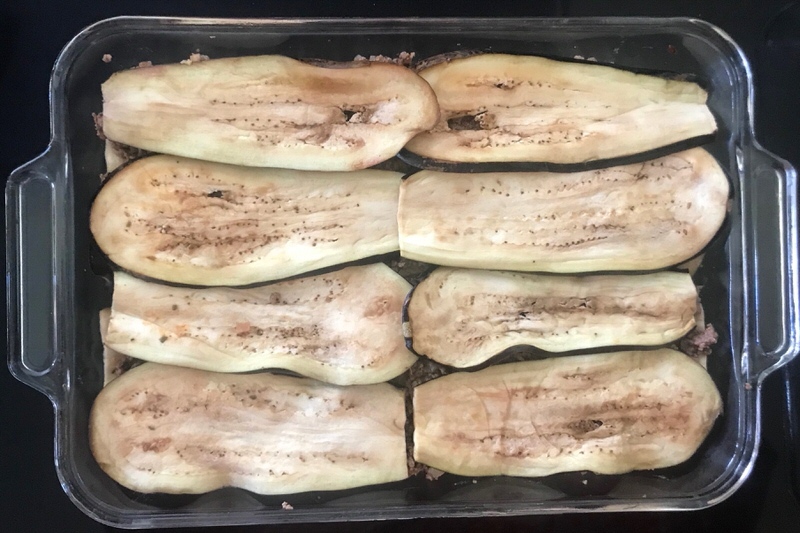 Can you see that this time I tried eggplant instead of zucchini? I likely won’t do this again. 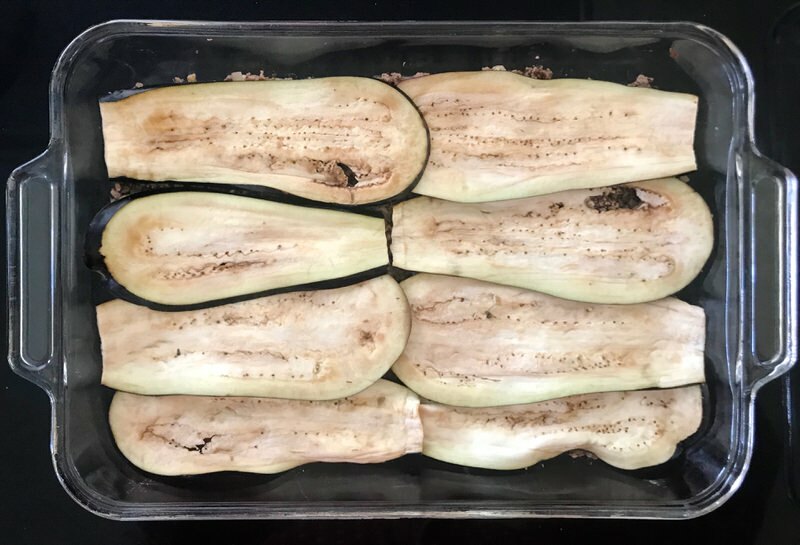 Though I like the taste a bit better, the difference in taste isn’t as significant as the nutritional value between zucchini and eggplant. 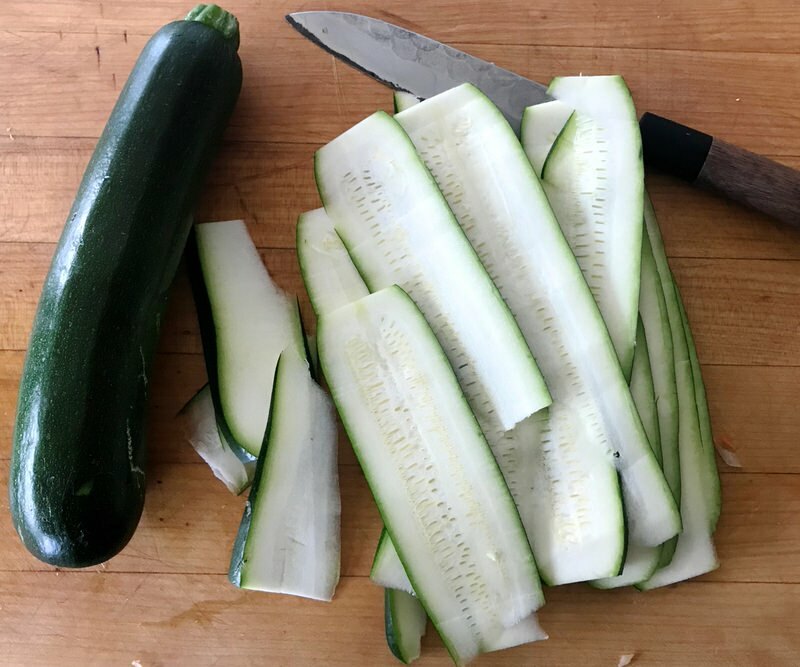 Shockingly, zucchini has fewer carbohydrates and more protein than eggplant. 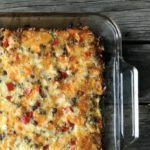 Protein in a vegetable like this? Who knew? 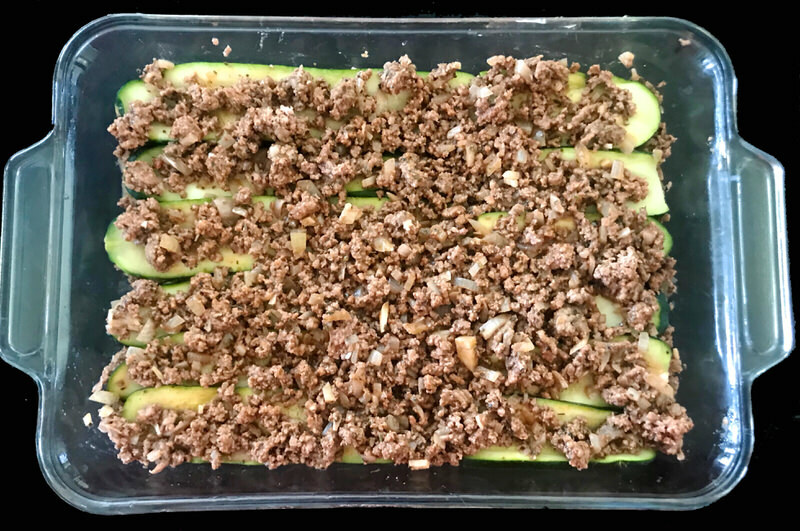 Zucchini (1 medium or 196 grams): 6.6 grams carbohydrates, 2.4 grams protein and 0.4-grams fat; eggplant (one cup chopped): 8 grams carbohydrates, 0.83 grams of protein and 0 grams fat. 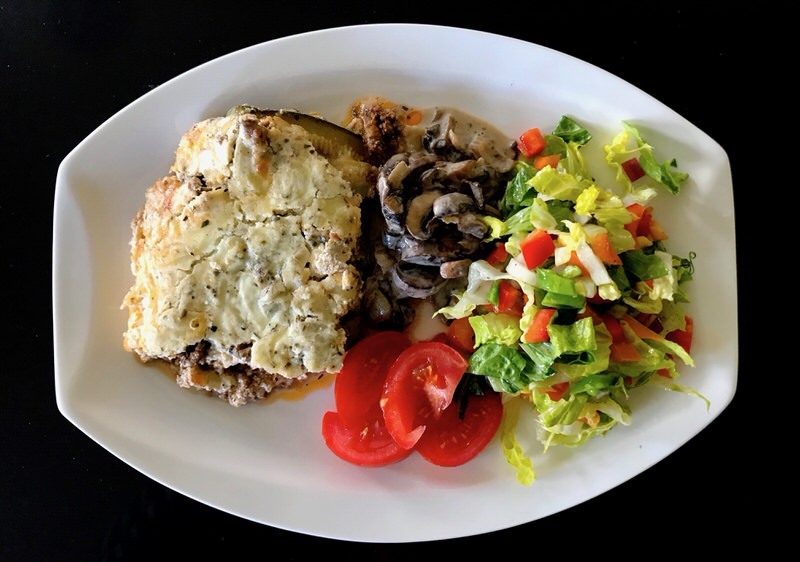 Above, a layer of meat sauce (2 1/2 cups) followed by a layer of the zucchini (or eggplant). 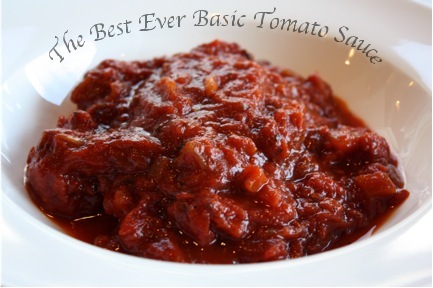 Top veggie layer with another 2 1/2 cups of meat sauce (5 cups per recipe) and then usually the topping. This time, I did an extra layer of vegetables. I learned it is better without the extra layer. Why? 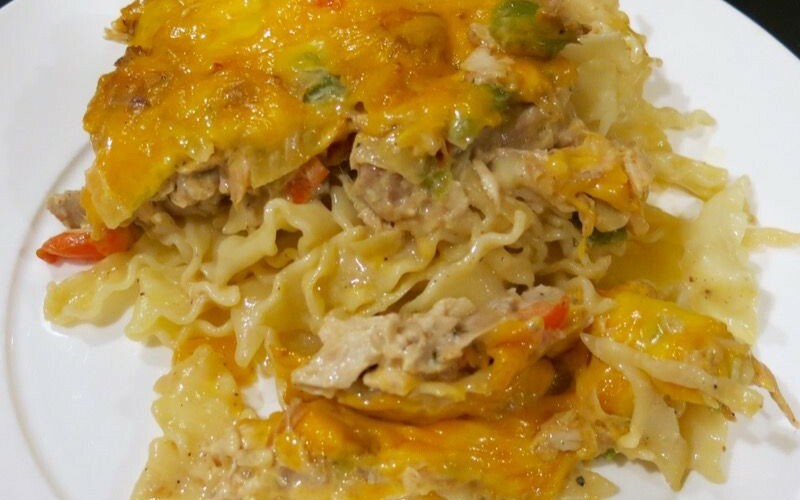 Of course more filling, more calories and more carbs with the extra layer, but not necessary. Filling enough and more well-rounded macros for the evening meal without. 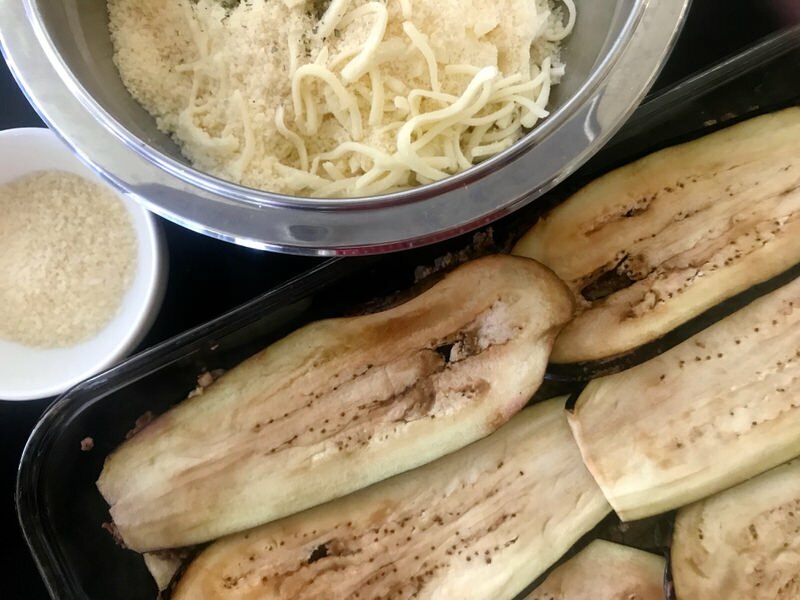 Above, the ingredients for the topping were mixed up and ready to spread over the eggplant. I love my offset spatulas! 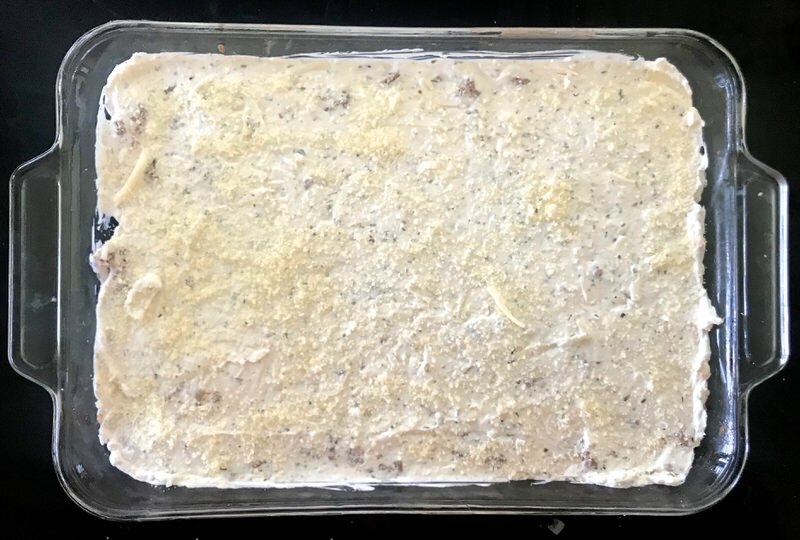 Just needs to be topped with the 2 tablespoons of Parmesan set aside from the topping and can then be baked or frozen. 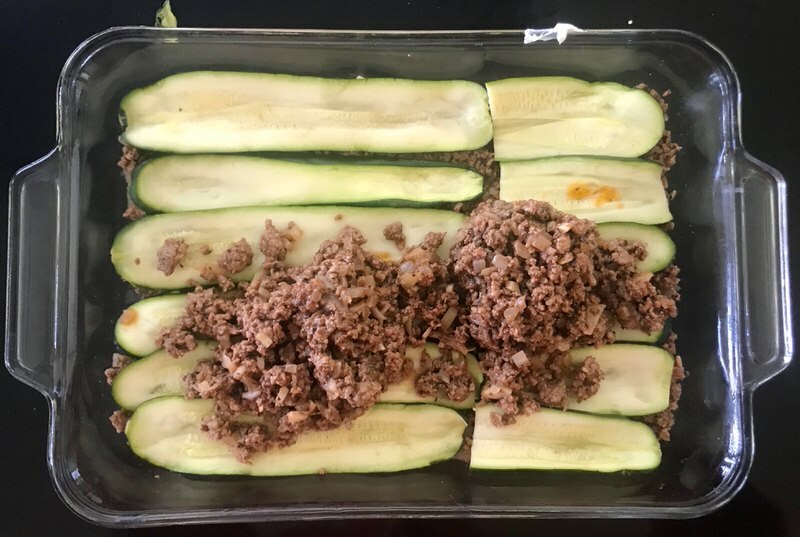 Traditionally, meat sauce, above left, under the zucchini with a second layer of meat sauce topping the vegetable layer. 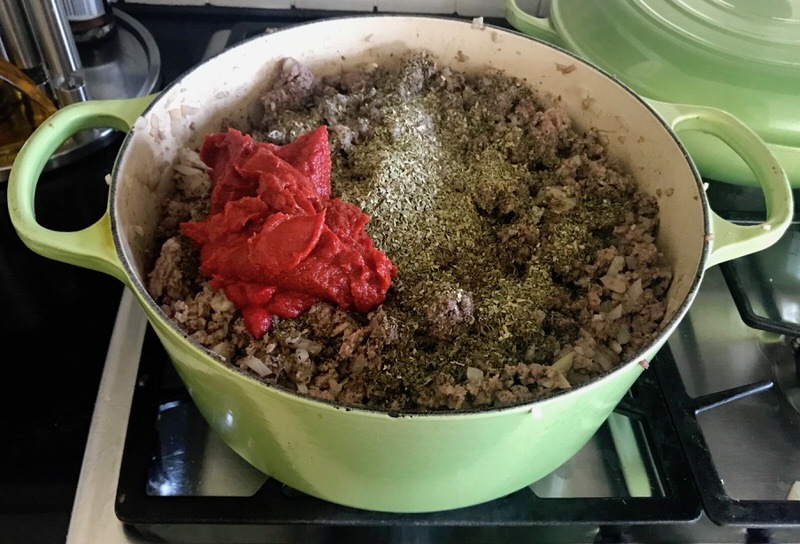 Cheese topping is then spread over the meat sauce. 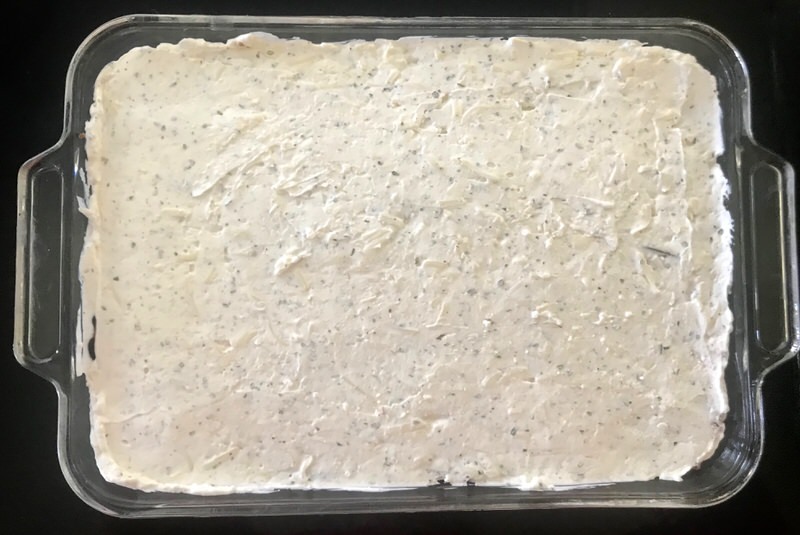 It is not difficult to do if you dollop it in portions over the surface area and use an offset spatula to spread evenly over the top. 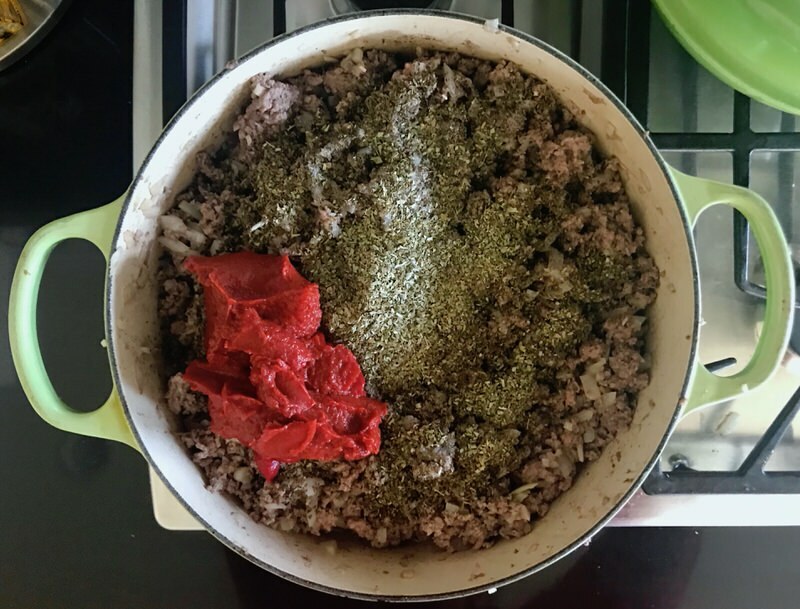 Sprinkle the Parmesan over top, and voilà! We did this with each of the 4 recipes and it took about 90 minutes, total, excluding the zucchini preparation the day prior. Into the oven, out of the oven, and portioned into 6 servings. I eat 1/2 portion for my daily evening meal as my metabolism is slow so my calorie intake is minimal. However, I have never been hungry – well, rarely. 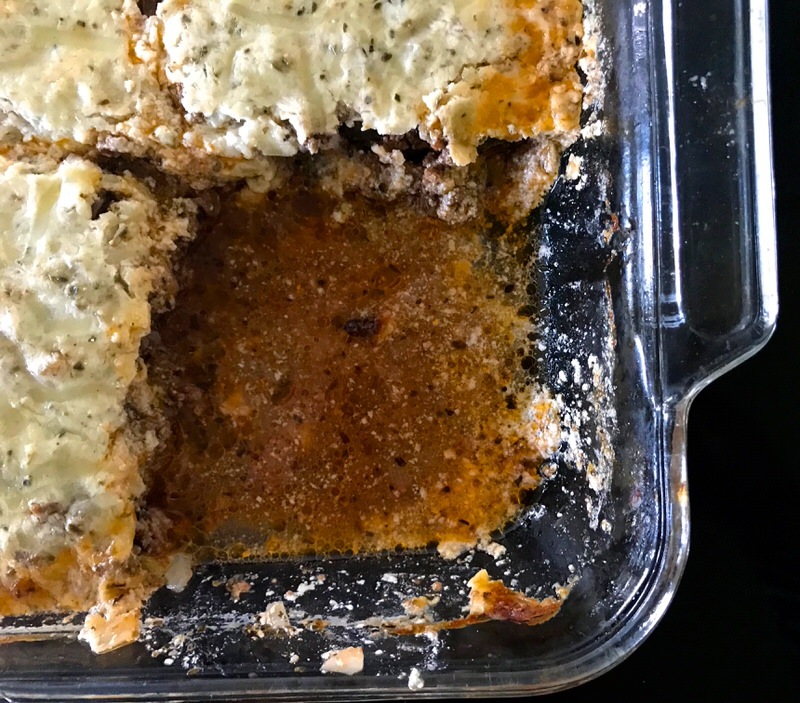 Keto Beef Zucchini Lasagna: Serving it up! 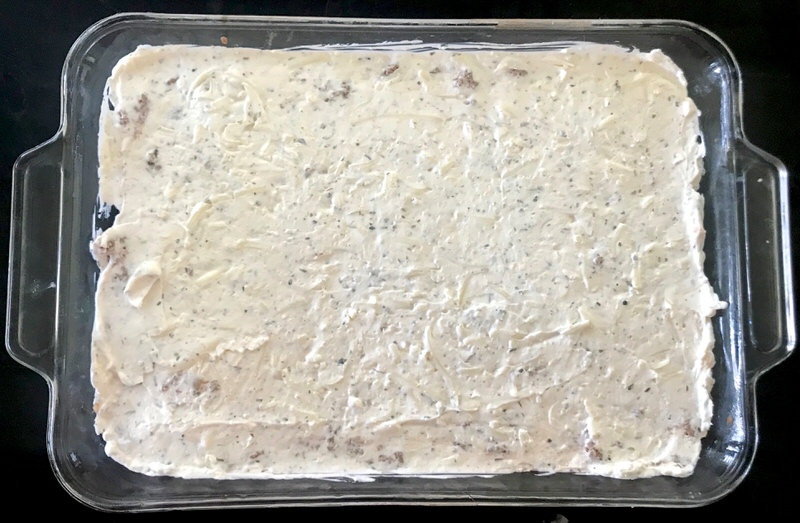 Let it sit for 20-30 minutes before slicing. It will still be warm. 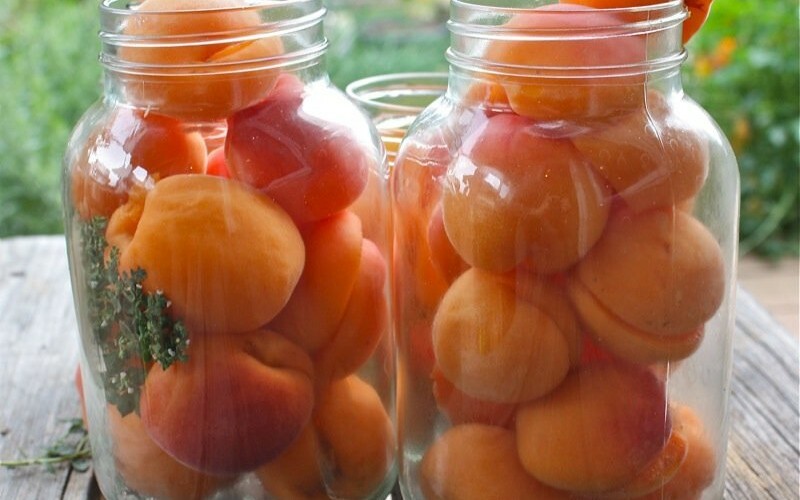 Clearly, juicy, too, but manageable and easily portioned. Oooh, mama! Unless you’ve made it and tasted it, this may not be your reaction, so you must! No? So many friends say to me, “Don’t you eat vegetable?” Of course, I do. See? 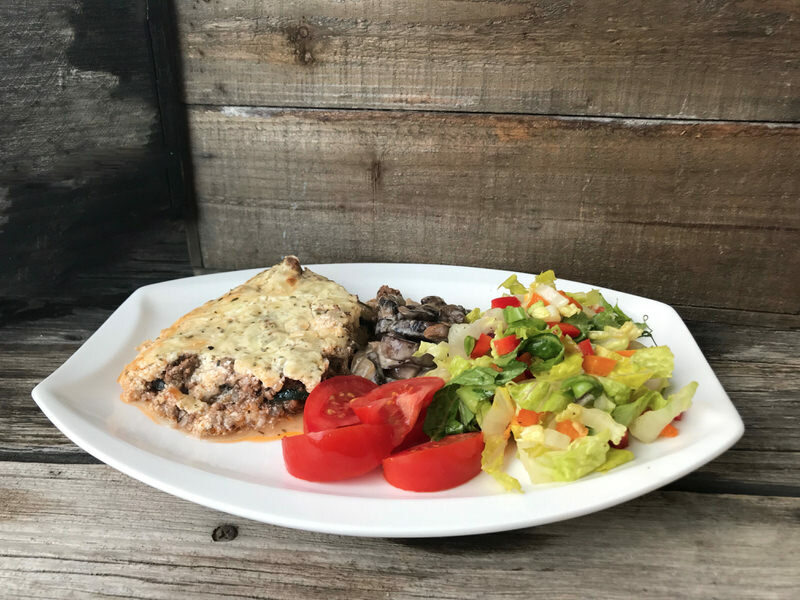 Salad, fried mushrooms, tomatoes and the Keto Beef Zucchini Lasagna! 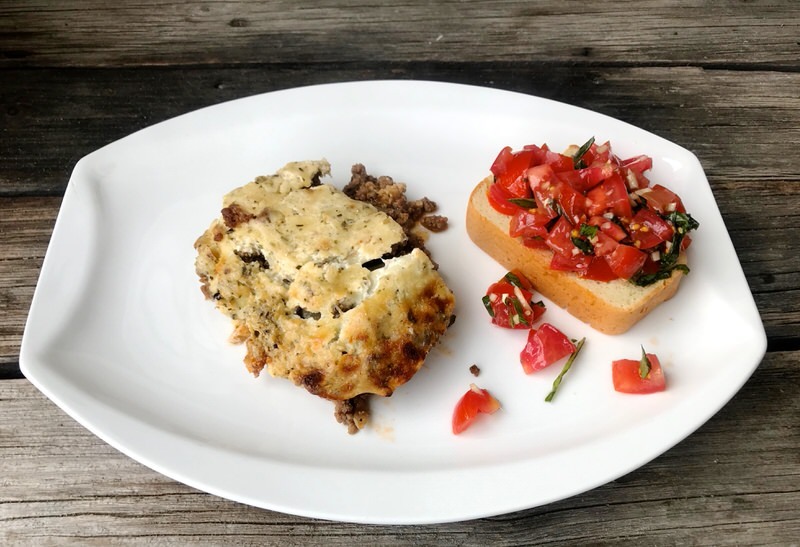 Another time, I served it with some delicious homemade Bruschetta and Homemade Keto Almond Bread. Above, Vanja’s portion for his evening meal. Mine is exactly half. 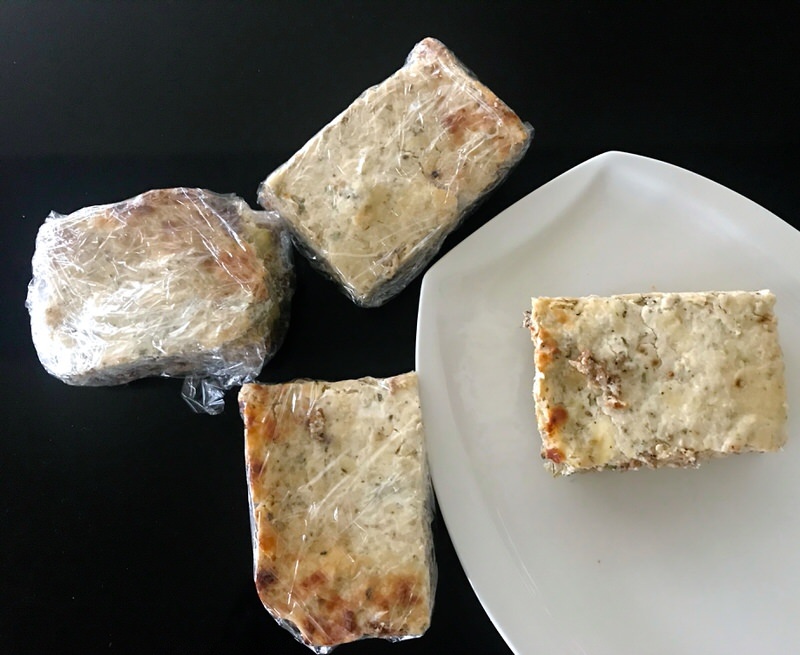 After a night chillin’ in the fridge, the slices are wrapped and frozen for easy individual service another day! 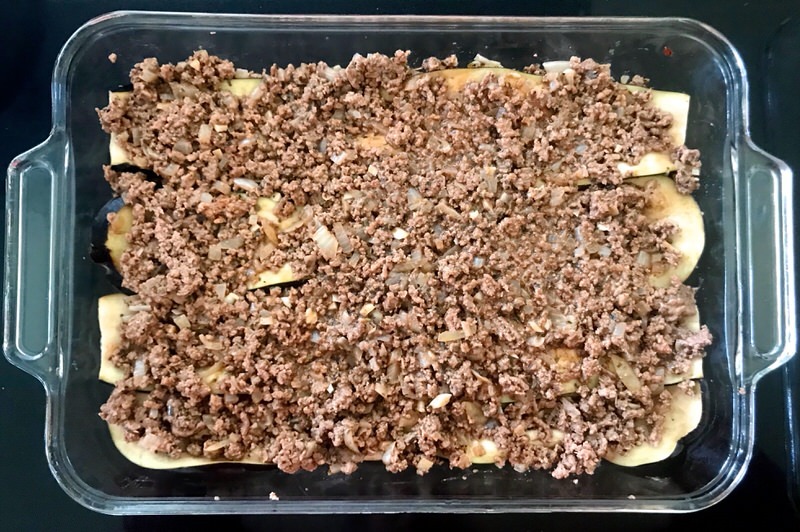 This recipe is part of Project 2019 as this is “the”year! 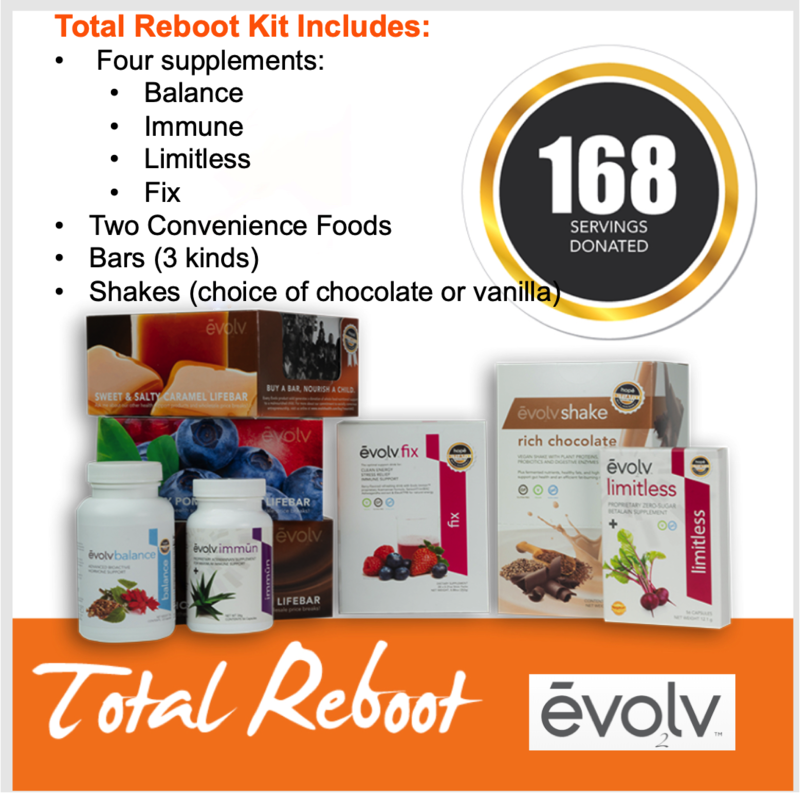 I am refocusing my eating to reboot my gut health and promote an active, healthy lifestyle with Saturday Morning Evolv Total Reboot Support Sessions for anyone who wants to join me. We’ve met every Saturday since January 1. Feedback has been very positive and no one has quit after month one, or month two, and most are now in month three! Me? Month 9. I have found that anything I undertake in life that really makes a difference takes determination, perseverance, consistency and a truckload of passion. A group of supportive like-minded people play an equal role in that magic mix toward success. 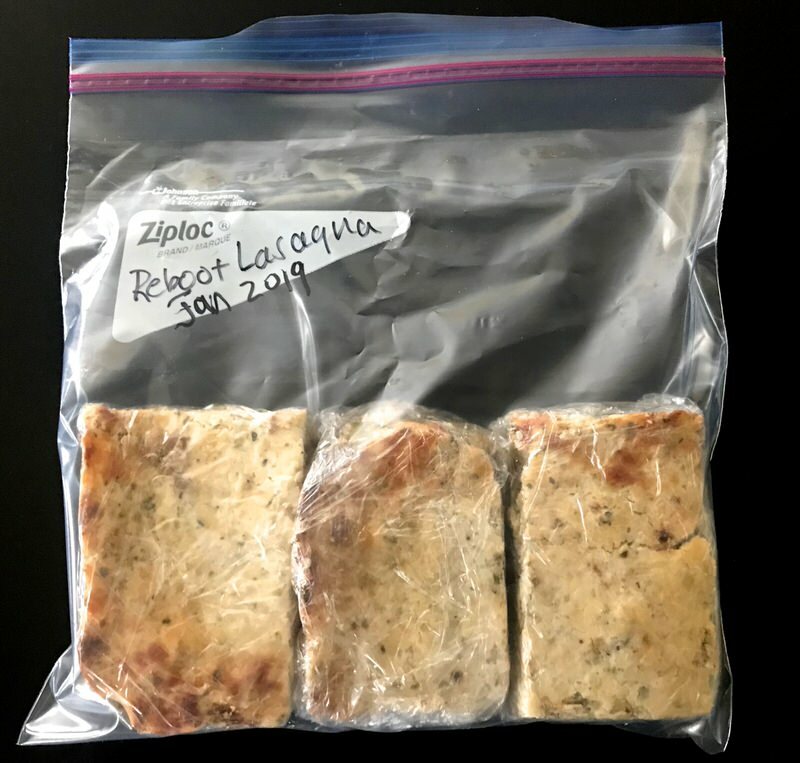 Refrigerate, then wrap leftover individual portions in plastic wrap, place in labeled and dated freezer and freeze for up to three months. 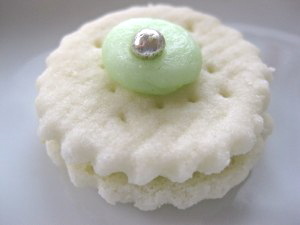 This is my favourite recipe! we definitely need to not deviate from the original! The topping is necessary! EVERYONE must try it!